“Rembrandt’s use of chiaroscuro heightens the sense of …”, — oh, ok, I’ll learn about art tomorrow, right after I open this book on quantum mechanics and start preparing for a marathon… And yet another day for the ivory tower of art to be unassailable. That’s a simple fact that people on the street like me or Homer Simpson don’t know much about art. It is not like we don’t want to know about. It is simply not that easy if you already devote your time to work, friends, sport or have to commute for hours during the day. Life in cities leaves its traces on our habits and the way we do things, that’s why the key idea of the Picasso Cat is to integrate art into our daily routine. If you are on a bus or in the tube, you have five or ten minutes to kill. Would you read an analysis and critique of The Scream by Edvard Munch or play Candy Crash Saga? But what if we combine the fun component of games with art? We want to combine people’s devotion to cats into a game that takes five or ten minutes to play. It’s fun, it’s visual, it’s entertaining. 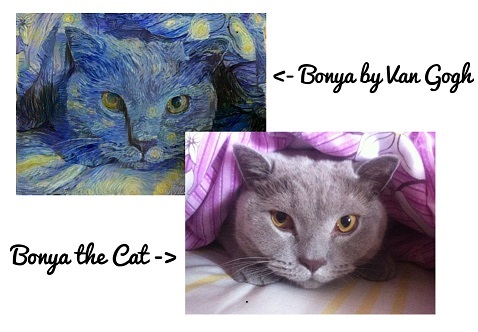 You browse cat’s pictures and you notice that they resemble something. Hm, maybe that’s a famous painting? “Oh, yes, that’s the famous Picasso’s self-portrait, btw” — says the app. So while on the tube, why don’t you do something useful? Like browsing cat’s pictures. 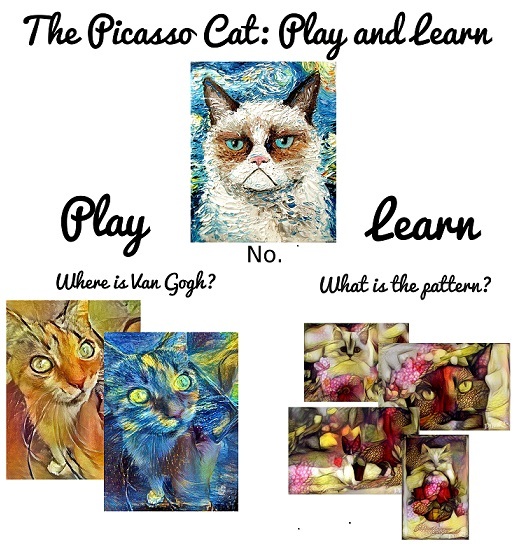 Our goal is turn learning about art history and famous paintings into a game, based on cats, of course: imagine you are given two cats pictures (on the left in the first figure), can you figure out which one resembles the style of Van Gogh? Or maybe you can have a look at a series of cats pictures and find a pattern (the pictures on the left in the first figure)? Does it resemble a famous painting? Like someone carrying flowers maybe? What we know for sure: people love cats. They can teach even me or Homer. So come for cats, stay for art.